Winters and dry fruits go hand in hand but so does proteins to keep us warm. 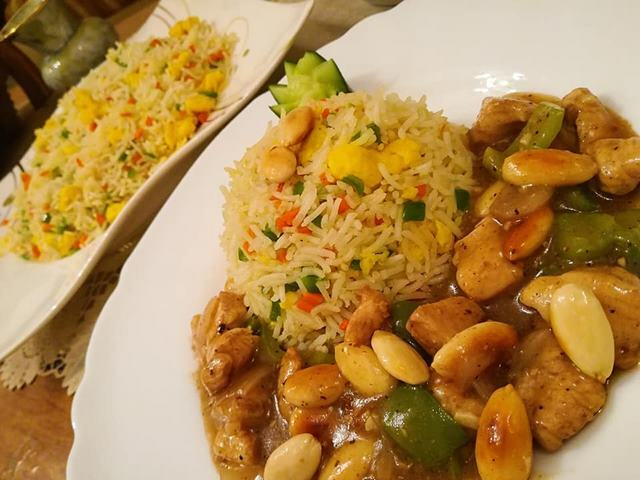 How about you combine the two and come up with a finger lickin’ good Easy Almond Chicken Recipe that combines both the resources and gives you a culinary masterpiece! Good to go with fried rice. Marinate chicken with salt, soya sauce and Worcestershire sauce and set aside. Marinate capsicum and onion with soy sauce and set aside. Blanche almonds and peel off. In a large wok, add oil and roast almonds. Take them out once crunchy. Now add garlic and saute for a few seconds until aromatic. Add chicken and stir on high heat until done. Add in vegetables and stir fry. In a separate sauce pan mix water and stock cube and cook for a few seconds until the cube is dissolved. Now add this stock to the chicken and cook on low flame for a few seconds. Mix corn flour in a quarter cup of water and add gradually. Cook until you get your desired consistency. Serve hot and fresh with fried rice.